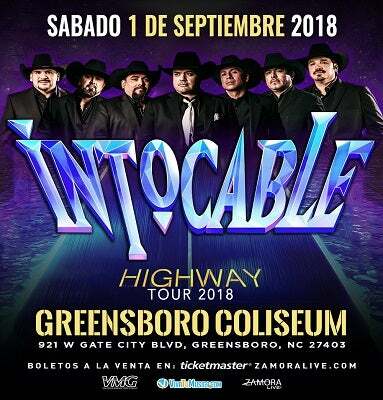 The iconic group INTOCABLE will officially conclude its Highway tour with a series of shows in the United States and Mexico, including a Saturday, Sept. 1 performance at the Greensboro Coliseum Complex’s Special Events Center. Tickets will go on sale Friday, June 15 at 10 a.m. at ticketmaster.com, the Greensboro Coliseum box office and charge-by-phone at 1-800-745-3000. The incomparable group, which already has more than 1 billion views on YouTube, added 40 million more with the videos from this album. During the two years since the launch of Highway, the group has been on a continuous tour, offering more than 200 concerts in the United States and Mexico. They managed to break records of attendance at the Monterey Arena with the most sold out dates in the history of the venue and gave a dazzling performance at the 30th edition of Premio Lo Nuestro where they celebrated being the most awarded group of its genre in the history of the award show with 23 awards in total. In 2016, the album earned them another Latin Grammy nomination for Best Norteño Album and the prestigious SESAC Icon Award. Each single was a mainstay on the top of the radio charts and upon release, the album remained at #1 in sales for multiple weeks.